To give a pill to the dog becomes challenging when he doesn’t like to eat. At that point of tough situation, you can’t skip the tablets as it will affect the health of your sick dog. 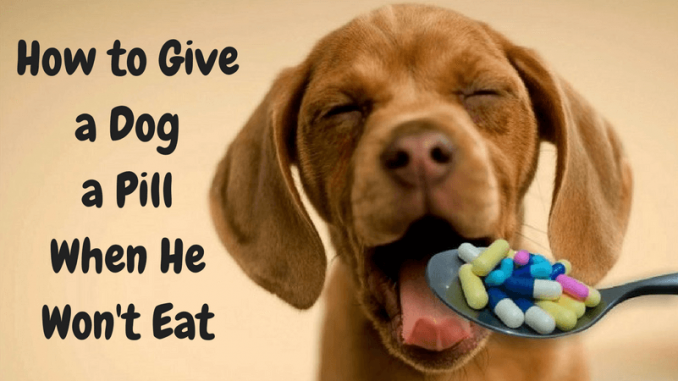 No need to worry at all!Here I will provide you top tricks that will guide you regarding how to get a dog to swallow a pill which will make your task stress free. Let’s move ahead with the essential guidelines. Add in the food – It would be easy for you to add the dog’s multivitamin pill in his food so that he can’t make out the bitter taste of the tablet. But make sure that you can’t apply this technique with all the pills and on every type of breeds. For example, the painkiller Tramadol has the poor taste which is profoundly rejected by dogs even in the food. In many ways, you can mix pills in the food so that your pet can quickly consume it. Wrap it in cheese, hide it in hotdogs and meatballs or blend it with creamy textures. You can make your four-legged friend eat medicine by making use of all these different ideas. How to give a dog a pill without food? Now and then your pet doesn’t feel like to have food or any eatables. In that case, you are unable to add pills to the diet, so you have to try other alternatives. You can apply the techniques of some tricky games in which you can ask your loving pet to participate, and once your pooch gets involved in the games, then you can make him eat the pill. This game works when you possess more than one pet in the house. In this game, you have to create the feeling of competition among pets simply. You can offer the pill-less treat to fit pet, and when that pet consumes the food, then you show this activity to the sick pet. In this way, the unfit pet will develop the feeling of competition in his mind, and when you provide the treat mixed with the pill, then he will consume it. It is the fun activity in which you can cover the pill in yummy food. Now you offer dog treat without the pill. You can move for the second treat too but make sure that should also be free from pills. Now provide the third medicine that contains pill. You can try the activity of pulling and offering the third treat for twice or thrice just to tease your pet. In this way, your canine will try to take the treat and will eat it. Now you can finally offer the fourth treat without pill which your pet will eat and can’t make out that you are playing the game with him just to make him consume the medicine. You can buy empty gel caps from the medical store in which you can keep the foul tasting pill in it. Your pooch can easily take the pill in this way. As a caretaker, your pet is comfortable with your company. In a cool way, you can press down the jaw of your pet which in turn opens his mouth in which you can place the pills with your hands. Make your pet feel that you are putting the treat in his mouth by holding his upper and lower jaw with your hands. In reality place the pill but throw the image of treat so that your pet can have it easily. All these are the effective ways to make your precious dog eat medicine. You have to be patient and calm while taking care of your pet. Your efforts with the guidelines mentioned above will surely provide your pooch easy recovery from illness. Enjoy the sound health of your pet by employing the easy and simple practices which will teach you how to get a dog to swallow a pill.